Heat gas or charcoal grill. In small bowl, mix cucumber, 2 tablespoons of the preserves, the mint, salt, onion and peach; set aside. Carefully spray grill rack with cooking spray. Place chicken on grill. 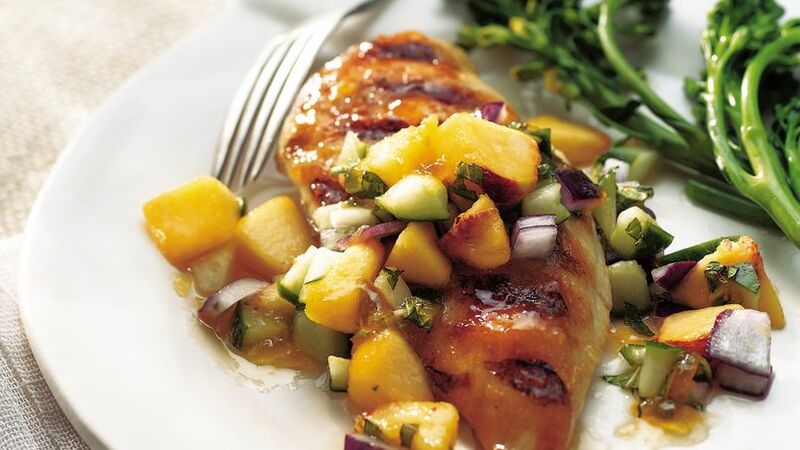 Cover grill; cook over medium heat 10 to 15 minutes, turning and brushing 2 or 3 times with remaining peach preserves, until juice of chicken is clear when center of thickest part is cut (170°F). Discard any remaining preserves. Serve chicken with salsa. Chicken breast is a lean protein choice. Protein supplies amino acids that give structure to the body in skin, cell membranes and muscles. The salsa can be made up to 24 hours in advance and refrigerated. Making it ahead will actually allow the flavors to blend. If you're using a charcoal grill, plan on about 40 minutes to prep the grill and heat charcoal to the correct temperature. Gas and electric grills will take about 10 minutes.